NASA’s Cassini probe at Saturn will be destroyed on September 15, 2017. The mission is ending to prevent losing control of the robot and contaminating watery moons that might harbor alien life. A rare and expensive nuclear fuel called plutonium-238 may be the last part of Cassini to melt and disintegrate. Space scientists are steeling themselves for a moment they’ve both dreaded and eagerly anticipated for years: The end of the Cassini mission — a fiery and spectacular death that NASA calls the "Grand Finale." The Cassini probe launched in 1997 as part of a $3.26-billion effort to explore Saturn and its swarm of strange moons. When the robot arrived in 2004, it dropped a small lander on Titan (an Earth-like moon) and began orbiting Saturn. It has made one astounding discovery after another there ever since. "The mission has been insanely, wildly, beautifully successful, and it’s coming to an end in about two weeks," Curt Niebur, a Cassini program scientist at NASA, said during a teleconference on Tuesday. "But Cassini will not go quietly." Early in the morning of September 15, 2017, Cassini will plunge into the clouds of Saturn to prevent contaminating any icy, watery moons that may support alien life. The spacecraft will burn up as a molten fireball of silicon and metal — and scientists say its last parts to disintegrate will be pods of exceedingly rare and vital nuclear fuel that made the mission possible. Two unavoidable complications led NASA to make the difficult choice to kill the Cassini spacecraft. 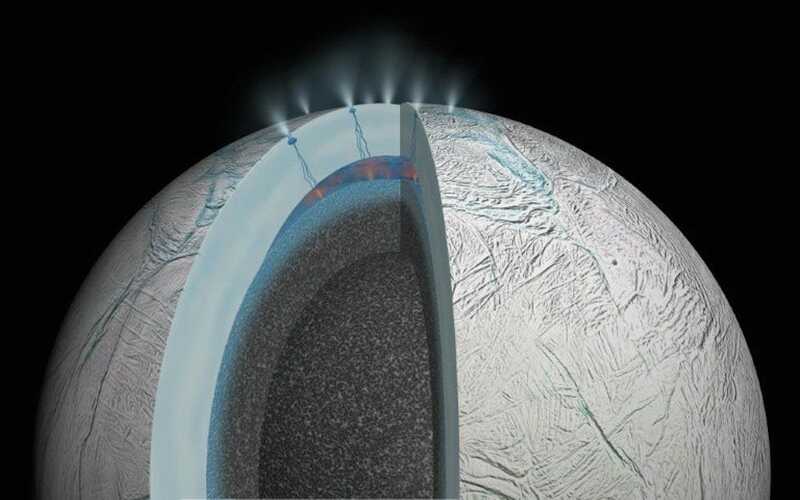 The probe discovered watery jets shooting out of an ice-encrusted moon of Saturn called Enceladus. This suggested to planetary scientists that the world hides a subsurface ocean and maybe even aliens. NASA/JPL-Caltech/AFP"Enceladus may have all of the ingredients needed for life as we know it to exist right now, at this very second," Niebur said. Introducing any bacteria stuck on the spacecraft, the thinking goes, may spoil the world and its hidden seas. 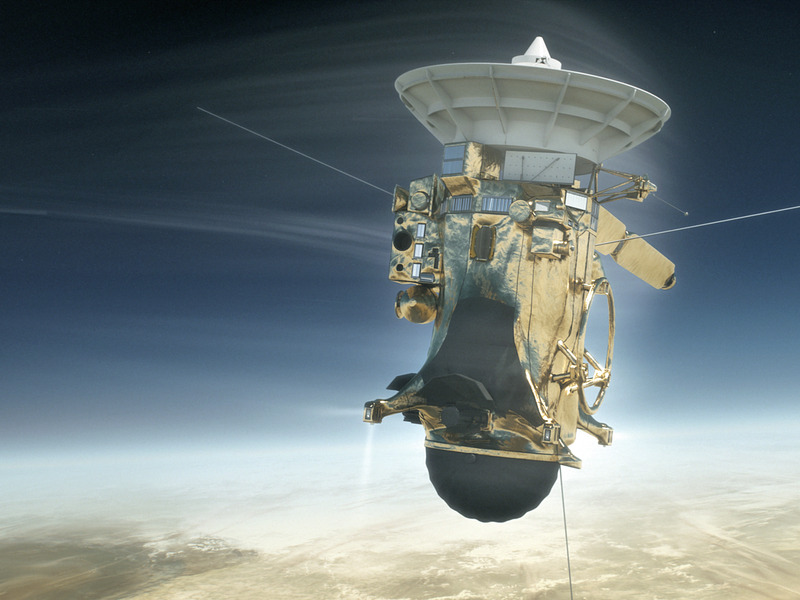 The second issue: Cassini has nearly run out of propellant that helps the probe shift its path through space and fly close to objects of interest. Thirteen years-worth of maneuvering has left Cassini with about 1% of its original 6,900 lbs of propellant. To avoid losing control of the robot — and crashing earthly microbes that are stuck to it into pristine moons like Enceladus or Titan, which might also harbor life — NASA kicked it into a death spiral on April 22. These final orbits placed the probe on a risky yet rewarding journey to slip between Saturn and its rings 22 times. While the last pass will destroy Cassini, its death will give scientists an unprecedented chance to study the atmosphere of the second-largest planet in the solar system. Earl Maize, an engineer at NASA’s Jet Propulsion Laboratory (JPL) who manages the Cassini mission, said the robot will take whatever readings it can during its final plunge into the clouds. "We will have repurposed Cassini into an atmospheric probe," Maize said during the call, "and we’ll have it broadcasting data back down to the very, very last minute." Maize and others said the last bit of Cassini to burn up will be its radioactive power supply. Solar panels couldn’t power Cassini at Saturn, which is about 1 billion miles away and receives sunlight just 1% as bright as that which shines on Earth. Batteries and chemical fuel cells also wouldn’t have kept the probe going 20 years, let alone a few months. So instead NASA went nuclear, as it has done with previous space probes like the Voyagers, and built Cassini around a rare and radioactive isotope called plutonium-238. Pu-238 doesn’t emit a bunch of neutrons (unlike Pu-239, its weapons-grade sister isotope), so it’s not used in nuclear bombs. Instead, it emits alpha particles as it decays, and this radiation can be stopped with a sheet of paper. However, within a dense lump of plutonium fuel, that alpha radiation can raise temperatures to more than 1,250 degrees Celsius. 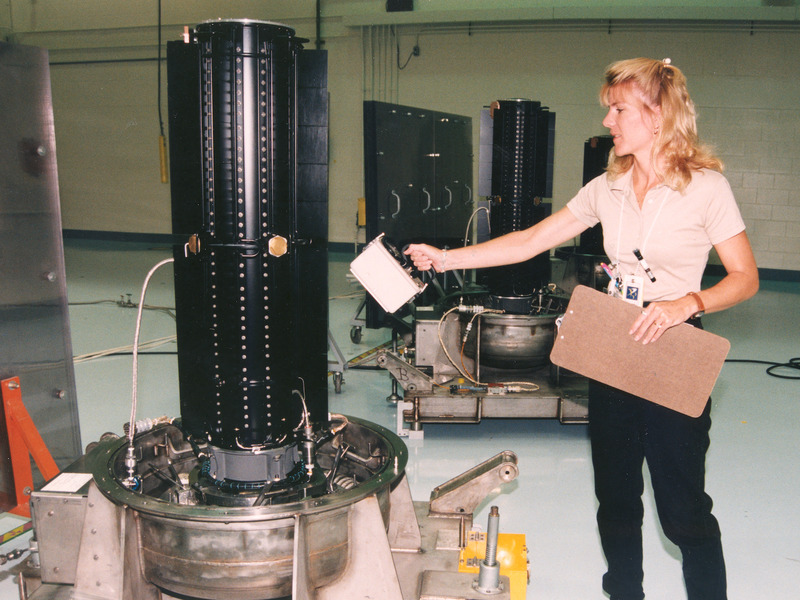 NASA/Flickr (public domain)NASA worked with the Department of Energy in the 1980s and 1990s to load this plutonium it into devices called radioisotope thermoelectric generators, or RTGs. Each RTG wraps several kilograms of Pu-238 (which costs about $4,000 per gram) with materials that convert a small percentage of escaping heat into electricity. For two decades, the three RTGs on Cassini have provided the spacecraft with a steady electrical power supply of nearly 900 watts — about enough to run a microwave oven. Scientists on NASA’s press call said this plutonium will be the last bit of Cassini to melt as the probe plows through Saturn’s atmosphere. This is because the plutonium is sealed inside clads or shells made of a super-tough, super-precious element called iridium. These clads were designed to contain plutonium if Cassini accidentally reentered Earth’s atmosphere. Julie Webster, the manager of Cassini’s spacecraft operations team at NASA-JPL, said during the call that the probe will heat up to nearly 500 degrees Celsius "within seconds" of its instruments breaking off and losing contact with Earth. 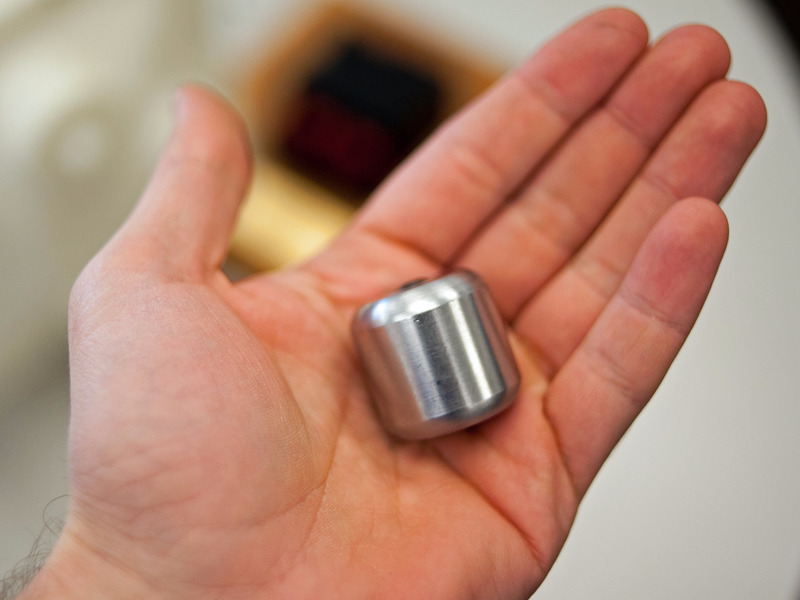 "We’ll reach the aluminum melting point within about 20 seconds," she said. "The iridium will be the last thing to melt, and it will go about 30 seconds after the aluminum." As the iridium shells melt away, the plutonium inside will glow and sprinkle across Saturn like a radioactive shooting star. However, this won’t necessarily make a bigger flash. "It’s just going to melt," Maize said. "It is going to be so hot at Saturn that it will quickly dissipate. … I think any possibility of it escaping is nil." The researchers said there’s a chance space and ground telescopes may see Cassini burn up in Saturn’s atmosphere. However, they noted the event will happen on the planet’s dayside and may get washed out in the glare of sunlight.